One of the questions we hear most is ‘what’s the best start-up equipment for T-shirt printing?’ Given the wide range of options in this market, that’s a challenging question. There’s dye sublimation, laser transfer, print and cut appliqués made with a digital printer and vinyl cutter, direct-to-garment printing, and good old fashioned screen printing. These methods all use heat to cure color to fabric, but that’s about the only thing they have in common. Each has its own set of advantages and disadvantages and prices range from a few hundred dollars to over thirty grand. Most people are looking for some kind of start-up package in a specific price range. To make it easier to sort out, we’ll group them into options under $5,000 and those between five and ten thousand. This article will focus on the first group. T-shirt printing options in the five to ten thousand dollar range will be covered in a separate article. What we offer here is a review of the best low cost options for T-shirt printing. What’s the best choice for you? That all depends on your priorities and budget. Sublimation is a natural process by which a solid or liquid becomes a gas. Dye sublimation is the process of turning a water-based dye ink into a gas that stains polyester, resulting in a vibrant and durable graphic. With dye sublimation, you simply design your image and print it in reverse using dye sublimation ink onto specific transfer paper. Then place the paper print-side down on white polyester, and press it at about 400°F. When the paper is removed, the image has been sublimated into the fabric. Advantages: Since there is no ink or media applied to the fabric, sublimation produces the softest transfers in the entire garment decoration spectrum. The transfers are also very washfast (meaning, the image won’t wash off if the garment is properly laundered). There are no design limitations dictating the range of colors or kind of images you can sublimate. Everything from fancy, full color images to simple logos will work (See Fig 1:). And sublimation can also be used to dye polymer-coated items like mugs and ceramic tiles. Sublimation is pretty easy to do, and the quality of the transfers is fairly consistent . Finally, one of the biggest advantages of sublimation is the low initial equipment cost. Depending on the size of the printer, startup packages including a basic heat press can be purchased for less than $1,000. If you already have a heat press, you can get started for under $600.00. Currently the Virtuoso product line consists both desktop and large format models. The desktop options consist of the Virtuoso SG400 and SG800 printers, which replaced the RICOH SG3110 and 7100DN models. The new Sawgrass Virtuoso VJ628 expands the envelope for desktop dye sublimation. The large format sublimation solution comes in the form of the new Virtuoso VJ628. Based on the MUTOH ValueJet line, the Virtuoso VJ628 adapts Mutoh’s intelligent interweave print firmware and rock solid reliability to dye sublimation using Sawgrass SubliJET HD ink. The MUTOH ValueJet platform is an excellent choice for those who want a trouble-free sublimation printer. The 24″ print width opens the door to lucrative markets like performance apparel and ladies fashion. The basic dual CMYK package squeaks in just under our sub-$5,000 target. It comes with Sawgrass Creative Studio software and templates, an installation kit, and two 100 foot rolls of QC Pro sublimation transfer paper. If that’s what you’ve been waiting for, click here and drop one into your shopping cart. Disadvantages: The main drawback is the fact that sublimation only works on polyester fabric or polymer-coated items. You can’t sublimate cotton shirts or uncoated mugs or magnets. Even cotton-polyester blends cause problems because the dye only adheres to the polyester. The second most vexing issue is the requirement of a white substrate. Since the dye is applied directly to the fabric, sublimating colored apparel will cause color shifts that may ruin the design. Click here for a more detailed explanation of this problem. Another common complaint is about the relatively high cost of dye sublimation ink, which is available from Sawgrass Technologies. And, since Sawgrass’ market strategy has been based on replacing OEM ink in other companies’ printers, there was the potential for conflict between Sawgrass customers and printer manufacturers who weren’t thrilled about supporting third party ink. That problem has been solved with the advent of the Virtuoso line of printers which are supplied directly through Sawgrass. Speaking of printers, you can’t use Sawgrass inks in just any printer. It must be a piezo inkjet printer for which Sawgrass has drivers. These are typically Epson and RICOH models. So if you have a perfectly good inkjet printer you’d like to dedicate to garment decoration, it may not be usable for sublimation. If you do have a suitable model on hand, the printer in effect becomes a one trick pony. It can no longer be used for office documents or other applications. Finally, as more substrates and shirts come to market from abroad, decorators are finding shifts in transfer quality because of variations in the density or softness of the coatings. 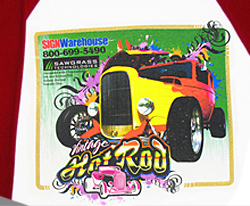 Fig 2: ChromaBlast produces sublimation-like transfers on cotton shirts. of cotton. Garment decorators prefer cotton because cotton shirts are much less expensive than polyester. ChromaBlast is Sawgrass’ solution for producing something like the quality and feel of a sublimated transfer on a cotton shirt. The process is almost exactly the same, but different inks and paper are used. The ChromaBlast paper is coated with a chemical that blends with the chemistry in the ink to bond with cotton fibers under heat and pressure. Advantages: The main benefits of ChromaBlast relative to sublimation are the aforementioned popularity and price of cotton shirts. Otherwise, ChromaBlast offers most of the same advantages as sublimation. The transfers are almost as soft, and there are no design limitations. And, like sublimation, ChromaBlast start-up packages are very affordable. At the moment, there isn’t a ChromaBlast solution in the Sawgrass desktop lineup, but a ChromaBlast Virtuoso option is in the works. Stay tuned. Disadvantages: ChromaBlast has the same disadvantages as sublimation. White shirts are required for best image quality. Grayscale will work, but colored and dark shirts won’t. In addition, the ChromaBlast chemistry tends to leave a slightly visible and tangible residue on the shirts immediately after pressing. This generally washes off the first time the shirt is laundered, but that doesn’t always happen on gray or pastel garments. The ink is less expensive than SubliJet, but that savings is offset by the higher cost of the paper, so the operating cost is about the same as sublimation. 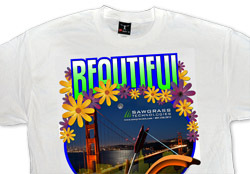 And, unlike sublimation, ChromaBlast can’t be used to decorate hard surfaces. It’s specifically for T-shirt printing. Finally, the problems noted above with the limited numbers of compatible printers and the single-purpose use of the printer apply to ChromaBlast as well as sublimation. New Developments: There are new solutions to the white shirt problem in the form of heat-applied print and cut media that is fully compatible with SubliJet or ChromaBlast ink. So if a sublimation shop gets an order that must be applied to black shirts, they can print and cut the graphic and apply it to a black shirt. That shirt can also be something other than polyester, which makes it more profitable. Click here for more information about the SubliTex solution. The same thing can be done with EnduraTex DarkJET sheets and ChromaBlast ink. Using the print and cut method requires simplifying your design. More on that later. And it won’t be as soft as either ChromaBlast or sublimation, but it does add a utility that can turn some lost opportunities into happy customers. The ChromaBlast option for the Sawgrass SG400 starts at only $699, so it’s extremely affordable. Tabloid-size cotton decoration packages featuring the Virtuoso SG800 start at only $1,799.00. Summary: If your goal is to create really soft transfers, If you want to create photo realistic images with soft edges and complex graphics, if you’re looking for the most affordable start-up package, sublimation or ChromaBlast cotton decoration might be right for you. If your goal is to create full color graphics that you can slap on any shirt of any fabric or color, keep reading. Laser transfer is a new alternative to dye sublimation that has some similar features and benefits. It uses a very similar transfer process whereby a sheet of paper is pressed to the apparel. The main difference is that the paper isn’t just an ink carrier, like that used for sublimation. It’s more similar to the ChromaBlast paper in that it has unique chemical properties required for the transfer. These are referred to as ‘self-weeding’ or “no weed” papers because only the toner transfers to the fabric. This gives them the ability to decorate light and dark garments, thus addressing one of sublimation’s main drawbacks. To decorate white shirts with laser transfer, you can design your full color graphic with very few constraints; bitmap or vector graphics, high resolution or bold, bright colors….taking care to avoid very light pastel hues. Then print it in reverse and heat press it to a white or gray shirt of any fabric; cotton, polyester, blends, cashmere, whatever. The most affordable option for decorating white and pastel apparel with a laser transfer printer is the OKI C831-TS. The C831-TS is a tabloid size printer that uses a conventional CMYK color gamut. It works with self-weeding one-step transfer papers like EnduraTrans One-Step or Neenah TechniPrint EZ. 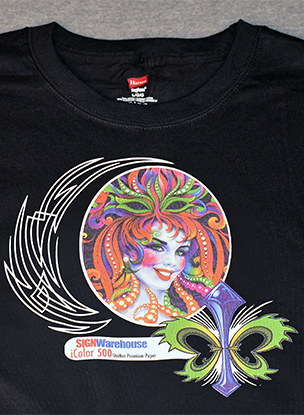 The c831-TS works similarly to the Sawgrass ChromaBlast solution, but isn’t hampered by the residue of ChromaBlast paper so decorated shirts are ready to wear right off the press. It also adds capabilities for decorating hard surface items like mugs, ceramic tiles, wood signs and more, so it’s a more versatile digital decoration platform than ChromaBlast. It’s also a little more expensive. The Oki c831-TS starts at $2,095.00. Fig 2: IColor printers produce photo quality transfers on both light and dark garments. White Toner: If you want to create laser transfers with a full range of color applied to dark and colored garments, you’re going to need a laser printer with white toner. There are a few options on the market including the OKI WT printers, and the UniNet iColor Series. All of these support full color photographic image quality comparable to DTG and screen print. The OKI PRO 98432WT and OKI 711 WT use a CMYW (Cyan, Magenta, Yellow, White) toner set instead of CMYK. The white toner is printed last so it becomes the under-base when the transfer is applied to the shirt. This of course requires two-step paper, a swing away press, and a little finesse. But the applied image has a soft hand and photo-realistic quality. The durability is about the same as the CMYK laser transfers, but there’s a slight trade-off. The density of the white toner can be varied slightly. A higher density setting makes the image brighter and more opaque, but less washfast. Also the design must be optimized for the paper. The OKI WT process requires adding a white layer and a clipping path in Photoshop, which can be time-consuming and difficult. Adding Forever TransferRIP software greatly simplifies the design process. You can create your artwork in CorelDRAW, Photoshop, Illustrator, LXi or Flexi Sign. TransferRIP adds the white layer for you. It’s a great time-saver. It also reduces toner costs, and softens the feel of the transfers by inlcuding screening options that convert the solid layers of toner into halftone patterns that allow the fabric to ‘breathe’ through the toner. iColor TransferRIP software adds time-saving features and reduces toner cost. The UniNet iColor Series takes a different approach. The iColor 500 is an A4/letter size printer that comes with five toner cartridges: CMYK plus White. The presence of a Black toner cartridge overcomes the main weakness of the OKI WT CMYW configuration. The result is a printer capable of rich blacks and high quality office documents. The printer only holds four cartridges at a time, so you have to choose CMYK or CMYW. The iColor TransferRIP is included in the purchase price. The iColor version of the rip adds a color mapping feature that enables users to load the various toner configurations. There are three options: CMYK, CMYW with white printing over the process color (as in the Oki setup) or CMYW with white printing under the process colors for use on dark card stock, clear static cling, and other non-transfer applications. 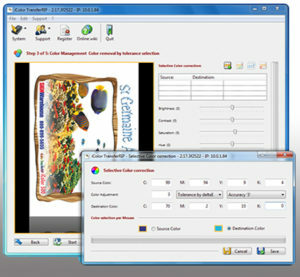 iColor TransferRIP also Draincludes the screening option for softening transfers. If you’re looking for a do-it-all T-Shirt printer for a decent amount of money, it’s hard to beat the versatility of a laser transfer system, especially one with white toner. The iColor 500 handles letter size sheets and starts at only $3,595.00. The Oki 711WT starts at $3,395.00. Advantages: Laser transfer has many virtues. The most appealing is the soft hand of the transfers, especially when applied on white garments with one step self-weeding paper. It’s also quite versatile. As noted above, the process works on cotton, polyester, cotton-poly blends and other fabrics. Like sublimation, laser transfer can also be used to decorate hard surfaced items like mugs, mouse pads, magnets, sign blanks, and ceramic tiles. Unlike sublimation, these objects do not require any special coating in order to receive the toner. The other versatility advantage comes from the fact that an OKI or iColor printer can be used for both heat transfer applications and standard office document printing. And, since the heat transfer applications use OEM toner, there’s no tug of war between the OEM printer manufacturers and garment decorators. And unlike sublimation, laser transfer can be used to decorate dark garments without purchasing additional equipment. Drawbacks: If there is an achilles heel for laser transfer printers, it’s the paper. Self-weeding laser transfer paper has a very narrow range of temperature and pressure. A temperature variance of ten degrees can affect the quality and feel of a transfer or defeat the first step of the two step process for decorating darks. It is very important therefore, to make sure you have a good quality heat press, and make sure it’s calibrated. Click here for more details on how to do this. Speaking of heat press requirements, our experience indicates that the two-step papers work much better on a swing away press than a clam shell. So if you have a trusty Mighty Clam or DK16, you may need to upgrade to an EnduraPRESS SD20, Knight DK20S, or Hotronix Fusion in order to produce consistent quality laser transfers on dark garments. Not to worry. It doesn’t have to be a high end swing away press. Even a little EnduraPRESS SA12 or Geo Knight JP14 JetPress will work. It produces substantial pressure evenly across the garment. Finally, the two-step weeding process can be delicate, even with a calibrated swing away heat press. It takes a little practice and finesse to get it right. But then, so does fine tuning a vinyl cutter or squeegeeing ink through a screen press. The bottom line is laser transfer for dark fabric is pretty nifty, but not quite as easy as Sublimation, ChromaBlast or print and cut appliqués. The other affordable option for T-shirt printing is a print and cut process using adhesive backed inkjet paper. As Jimmy Lamb pointed out in our Digital Decoration 101 webinar, it’s not really a “transfer” because you’re not using paper to transfer ink or toner into the fabric. You’re actually creating a decal that you heat apply to the apparel. There are a few more steps in the process and there is more specific equipment required, but the print-and-cut offers some unique benefits. For simple, spot color “Graphic Tees”, you can also just buy a vinyl cutter and use heat transfer film, aka T-Shirt Vinyl. But that’s not really printing. So we’ll talk about those in a different article. For print and cut T-shirt printing, obviously you’ll need a printer and a cutter. Almost any printer will work, but you’ll need a vinyl cutter that can read registration marks, and software that can coordinate the printer and cutter. And of course, a heat press and the right adhesive backed inkjet paper or film. Fig 4: This image has been printed, contour-cut and weeded. Now it’s ready to press. It’s basically a three step process – I guess we should call it print, cut, and press. First, you design a graphic with a defined cut path around a printed image. Think of something like Superman’s S or Ford’s blue oval. The software should add registration marks to the design. These will be printed with the image on your inkjet paper of choice. Then you place the print on your cutter and use its registration mark sensor to find the first mark. Then send the cut job to the plotter. The software drives the registration mark sensor and the cutter finds those, then automatically places a “kiss cut” around the edge of the printed image, creating a contour-cut decal. Remove the print from the cutter, weed it, (remove the excess vinyl See FIG 4) and peel the liner. Place it on the shirt, press it and you’re done. Some films require tape to transfer the weeded graphic from the release liner to the shirt. If you use tape, make sure it’s the right kind, and leave it on the applied graphic until it’s cooled to room temperature. Did you get all that? No? That’s okay, you can download a step-by-step tutorial that explains it fully. Advantages: The white inkjet paper serves as the under-base for your CMYK graphics the same way as white toner in an OKI WT printer. This means that your color print will look correct, vivid and opaque no matter what color the shirt might be. And, since you’re not transferring ink directly to the apparel, you’re not limited to a particular kind of fabric. The heat press stage is much easier and more forgiving than laser transfer, and you don’t need a calibrated swing away press to make it work. Because there are heat-applied films for all kinds of inks, including basic desktop inkjet printers, print and cut is a very affordable option. If you choose a universal paper like EnduraTex DarkJET, just about any inkjet printer will work. 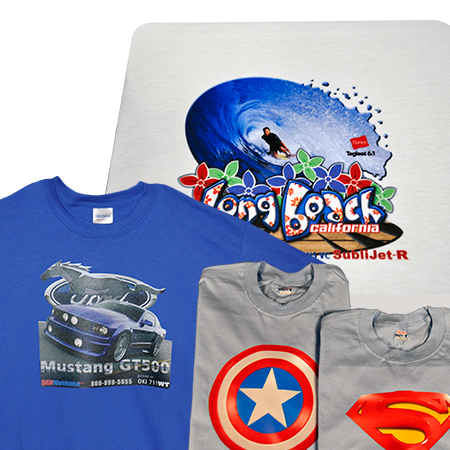 Like laser transfer, the print and cut process can be used to decorate lots more than shirts. You can produce decals for vehicle graphics, laptop and tablet skins, wall graphics, and more. By the way, these other applications don’t require a heat press. But they do require different media: printable vinyl or sign vinyl. Disadvantages: Compared to sublimation and laser transfer, the print and cut process requires a few extra steps and of course a fairly advanced vinyl cutter with a registration mark sensor. Adequate software is also required to coordinate things. So if you have an entry-level five hundred dollar vinyl cutter, you’ll probably need to upgrade your equipment. Your designs will need defined borders to make it easier to weed and apply the graphic. No feathered edges. And of course, the appliqué won’t be quite as soft as soft as sublimation, ChromaBlast, or white toner, but if it’s printed on a thin PU, film it will be very soft on the shirt. Some films are thicker than others. So if softness is a priority, choose wisely. Also, not all films work with all inks. The lower cost universal films like DarkJET are heavier but can be used with aqueous inkjet, solvent inkjet, and even laser transfer. If you choose to use your desktop inkjet printer, be aware that many of these printers use dye based ink, which is the least durable formula available. These prints are not very washfast. Shirts decorated with pigment based inks will be more durable. Click here for more about printable vinyl. The softer PU films like HotMark PRINT and Siser ColorPrint PU are made for solvent, eco-solvent, and Latex printers and won’t work with aqueous inks. They will also work with a PrismJET VJ24 printer. All of these options are in the above $5,000 category so we’ll explore them more in the next article. New developments: As noted above, the print and cut process can be used to augment sublimation, ChromaBlast, and laser transfer. 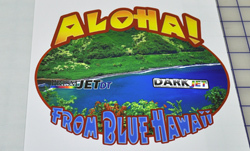 DarkJET sheets are universal and can be printed with aqueous or ChromaBlast ink, or GO UNO/OKI C831-TS toner cartridges. So a ChromaBlast or OKI user who wants to create opaque decals on black shirts only needs to add a good vinyl cutter and LXI software. This can be done for as little as $699 with the purchase of a Vinyl Express Rogue and some DarkJet sheets. A dye sublimation user can do the same with a cutter and EnduraTex SubliTex sheets. These are compatible with Sawgrass ink and produce an opaque sublimated appliqué that is then contour-cut and heat applied to any fabric or color ( Fig 5). So you can use print and cut as a standalone T-shirt printing solution or to add opacity to something softer. So you have lots of options, but we hope you now have some guidance that will help you pick the right T-shirt printing method or mix of methods for your business goals. To help you sort out the pros and cons, we’ve devised a chart that compares all of these methods side by side. For each method, there are hard numbers like start-up cost and average operating costs. Each is also ranked on a scale of one to five for ease of use, versatility, durability and more. You’ll probably find that not one method fits all your needs perfectly. So you’ll need to prioritize what metric is most important for you. If you value versatility above economy, sublimation may be the wise choice. If decorating dark garments is a must, you may be better served with a laser transfer or print and cut process. Click here to view or download the comparison chart. We hope you find it to be a useful decision-making tool. All of these can be purchased for under $5,000, so they’re all affordable options. For those with slightly larger budgets, we’ll add a few more exciting options in the five to ten range next. If you’re really serious about garment decoration, you’ll probably end up with some combination of technologies to enable you to serve different kinds of customers. Sometimes it’s hard to predict what your customers will want. So just buy one of each! Keep the ones you like best, and give the others to your least favorite cousin.